Summer Beach Bag Essentials with Supergoop! 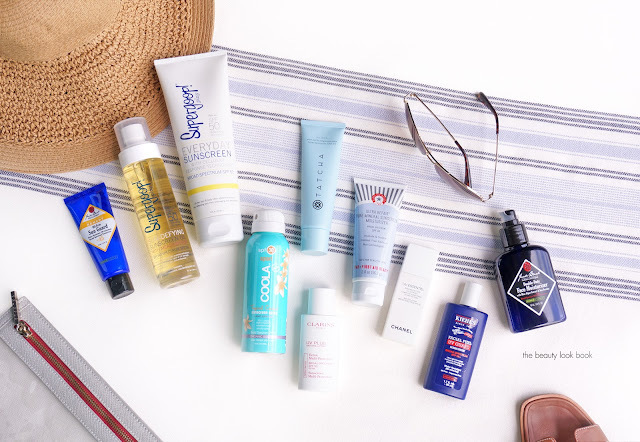 Today I’m excited to share a detailed look at some of my favorite sunscreens. Supergoop! is one of my go-to brands for sunscreen. I tried their oil first a couple years ago and have been hooked ever since. This summer they’ve introduced three new ways to wear SPF with a mineral, mist and mousse formulas. They reached out and asked me to try them and I couldn’t have been more thrilled. Everything is 100% on point from the packaging to the formula and finish..
Up first is a closer look at the Super Power Sunscreen Mousse with Broad Spectrum SPF 50. This is Supergoop!’s new way of delivering sunscreen in a whipped mousse formula. It has a lightweight feel but is super hydrating on the skin. It’s long lasting and perfect for the pool, beach or deck. There are two sizes and the nozzles on both are the same which makes it nice for easy application. The larger size is 7.1 fl oz while the mini is 3.4 fl oz. Below is a closer look at the mousse right out of the nozzle. I love that it doesn’t have that traditional sunscreen smell. Key ingredients for this one include blue sea kale for antioxidant protection which protects the skin against heat rays and also diminishes the damage from UVA/UVB rays. It also has a blend of shea butter, olive and avocado oils to keep skin moisturized and prevents it from getting dried out. Instructions are to reapply after 80 minutes of swimming. It is water resistant but it’s always recommended to reapply. Otherwise apply at least every 2 hours. Up next is the Defense Refresh Setting Mist with Broad Spectrum SPF 50. This one comes in 3 sizes and they are all 3.4 oz and under so all are TSA approved! This is one of Supergoop!’s answers to reapplying SPF on the face over makeup without ruining the work you’ve done for the day. They’ve improved the spray nozzle to produce an even finer mist based upon requests from customers. Love it when a brand takes customer feedback to improve their products, especially for ease of use! It has SPF 50 and you shake the bottle and spray in a circular motion on the face multiple times. There’s a ball inside to mix the contents up so be sure to shake it. This one has a hydrating feel. Last but not least is the Mineral Invincible Setting Powder SPF 45. This is a 100% mineral formula that will set your make-up, reduce shine and refresh UV and environmental protection. It’s a white translucent formula which works like a translucent setting powder. It’s good for touch ups and has a super soft brush to blend the powder. It gives the skin a blurred effect and looks white only for under minute before it sets and adjusts. I hope they will add a tinted version in the future (like their CC creams). It’s refillable and nice for on the go. The brush is retractable making it convenient to carry in your purse or beach bag. Shown below is the way it looks before you put it together. Simply twist off the white cap and insert into the base (it’s a twist kind of lock). My two favorites out of everything I’ve tried from the line include the Everyday Sunscreen with Cellular Response Technology SPF 50 and the Super Power Sunscreen Mousse SPF 50. The formulas are best suited for my skin type – I like these on the body and they are easy to reapply without feeling heavy. The formulas do have a hydrating effect and give the skin a nice glow without looking or feeling greasy. If you’re in search for a new summer sunscreen this season I hope you found this post helpful! I’ve been more diligent about applying and reapplying these days and I’m one who usually hates sunscreen because of the texture and scent. I’m so glad that brands are more aware of creating formulas that are suitable for everyday and not just for the beach. I’ve finally found some favorites and if you’ve tried any from the line let me know in the comments. Many thanks to Supergoop! for partnering to sponsor this post.